Choose the right kind of leather or suede for your next sewing project. Here’s a summary of the different types of leather and suede commonly available for sewing, including suggested uses for each type. Once you’ve decided to sew with real or fake leather or suede, the next step is knowing how to choose the correct leather or suede for your project. 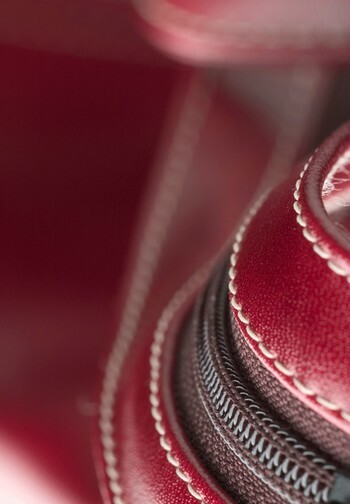 While patterns usually indicate fabric measured by the yard, most leather is sold by the square foot. To calculate the number of square feet you’ll need for your project multiply the suggested yardage on the pattern for 54 inch wide fabric by 13 1/2, the number of square feet in a piece of 36″ x 54″ fabric. Multiply the yardage for 45″ wide fabric by 11 1/2, and by nine for 36″ wide fabric. Next add approximately 15 percent to allow for waste. The size of each skin in square feet is generally marked on the back of each skin. Suede is simply the inside layer of a cowhide, pig or lambskin with a napped finish and the same rules of measurement apply. You might also consider using a synthetic leather or suede for your project as they can be real bargains at usually less than half the cost of natural leathers. COWHIDE – Whole cowhides are available in large sizes measuring from 20 to 25 square feet. Garments such as coats, pants and jackets can be made from these full hides. Half hides or sides can also be purchased for smaller projects such as hats, handbags or belts. Cowhide comes in heavy and medium weights and offers a wide range of colors and finishes. PIGSKIN – Pigskin is a light to medium-weight leather that comes in both sueded and non-sueded finishes and is available in a wide variety of colors. Pigskins are usually small, about 5 to 7 square feet, so they are generally used for smaller items such as handbags, belts or trims. LAMBSKIN – Lambskin is similar in texture to cowhide although finer. The average lambskin measures about 6 to 9 square feet and is generally more expensive than cowhide. Also available in many colors, lambskin can be used for a variety of garments such as dresses, skirts, coats, jackets, slippers, handbags and hats. SYNTHETIC LEATHER – Usually produced as a medium-weight fabric, synthetic leather is commonly made with a polyurethane face and a knit or woven backing. Available in a wide variety of colors and finishes, it can be used for any garment or craft project in place of real skins. SYNTHETIC SUEDE – Synthetic suedes come in a variety of weights and colors and are typically more expensive than synthetic leathers. Lighter weights are commonly used for vests, dresses, skirts, jackets and shirts while the heavier weights are good for pants, jackets and coats. SNAKESKIN – Smaller snakeskins are usually more delicate than the larger varieties. The color of snakeskins varies widely and the glossy finish generally comes from a thin layer of varnish or plastic used to help protect the skin. Because snakeskins can be fragile they are used mostly for small items such as belts, handbags and collars. SYNTHETIC SNAKESKIN – Similar to synthetic leathers, pseudo snakeskins have a fabric backing which makes them less fragile than real snakeskins. Sewing with leather, suede and snakeskin can be a real joy as they are the oldest and most luxurious of all natural materials. Selecting the proper medium for your project will help you to create a garment or accessory that you can be proud of for years to come!